Jazz that is easy to listen to and delivered at a reasonable volume. Prefect for receptions and corporate events. Our core band is a trio, but additional musicians and/or a singer can be added. We loved every bit of working with the Queen City Jazz Trio! Bob was so responsive, answered all our questions, and gave us really helpful suggestions of songs to consider (including samples!). We ended up deciding to add a vocalist and a saxophonist, and they suggested great people who integrated perfectly with the core group members. We engaged QCJT for our wedding ceremony and cocktail hour and they played a mix of jazz standards and bossa nova instrumentals. I can't even begin to describe how great their music turned out - the music ended up being one of our favorite things about our wedding and we are so thankful to Bob and the trio for pulling it all together. They are professional, prepared, and very very capable. I highly recommend them for any event. Great music and great guys! Our group truly enjoyed the music and the casual, fun atmosphere this talented trio created! These are professional and gentlemen. My event was a formal affair and the trio was in tuxedos. Music was exactly what I requested. Thank you for this connection and look forward to using this site for future events. We are not a dance band, but you can certainly dance to our music. 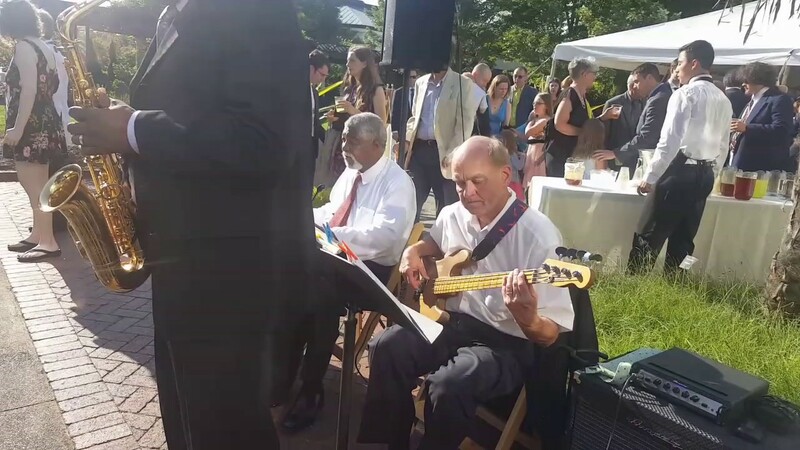 The type of music we provide is perfect for receptions or events where a light jazz band will add a touch of class. The Queen City Jazz Trio is composed of 3 long time professionals. Two of us are from New York City and one is from Chicago. Individually we have worked with some of the finest musicians including Buddy Rich, Harold Melvin and the Blue Notes, The Shirelles, Frank Wess, The Belmonts, Lenny Welch, TK Blue, Chuck Jackson, Jim McNeely, Frank Caruso, and many others. We have been playing together in Charlotte since 2015 and have performed at the Mint Museum, Stowe Botanical Gardens, The Steinway Gallery, South Park Hilton, Charlotte Aviation Museum, The Capital Grille, The Carolina Hotel, and many private functions. We play jazz standards, bossa novas, and smooth jazz. Our sound is perfect for corporate events, receptions, galas, etc. Our core group is keyboard, bass, and conga drums. We can add a singer and/or a sax player if your situation calls for that. We provide a good PA system. Please listen to our music and give us a call if you like what you hear. The Queen City Jazz Trio was a wonderful addition to our event. Their fantastic sound added a wonderful touch!! Also great to work with!! Such a perfect band for our hotel's Grand Opening event! Our guests, top clients, and corporate team LOVED them. Great sound and Bob was so great to work with. We will definitely use them again in the future and highly recommend them to anyone who needs a jazz band! Absolutely fantastic! All of our clients and advisors were raving about them. The music was perfect for the atmosphere and they even threw in a HAPPY BDAY song for one of our staff. Thank you for such a wonderful evening and special birthday celebration. The music selection was fabulous. The rhythms and harmonies were tight. You filled the space with beautiful sounds and I look forward to hearing you again. I also appreciate the way you shared your personal musical insights. Keep up the great work you are doing. Bob and his Team were wonderful to work with! Thank you again for arranging the concert the other week with the Queen City Jazz Trio and Nicci Canada. Although I was out of town that week, my colleagues that went said it was just wonderful. We heard lots of compliments from our residents, and know that they thoroughly enjoyed it. Great music and great guys! Our group truly enjoyed the music and the casual, fun atmosphere this talented trio created! We loved hosting the Queen City Jazz Trio last week and were amazed with their musical talent. We hope to hear another performance from them soon! We provide a PA System.